On Saturday night in Hoboken, entire neighborhoods, strewn with garbage and debris, were in total darkness. Floodlights lit the odd corridor. National Guardsmen hauled water and food supplies into City Hall, where a makeshift volunteer headquarters had been constructed. Inside, I met Jim Farina, the city clerk and a sixty-six-year resident of Hoboken. Like seemingly everyone nowadays, Farina was in shock. “I thought I’d seen everything,” he said. But amidst the flood damage and power outages, Farina harbored another crucial concern: widespread disenfranchisement ahead of the presidential election on Tuesday. Notices posted around the city indicated that all polling sites would be operable by Tuesday, but Farina had no idea if that was in fact true. And finding out was not his priority. As we spoke, someone ran into the volunteer HQ and alerted the police captain on duty that a hysterical man was threatening people with a knife on Jackson Street. These are the stories one now hears across New Jersey. In storm-afflicted areas, some folks get mildly offended when I inquire about their plans for Tuesday, because—absolutely justifiably—voting is just not on their agenda. Many had not even begun to consider it. But even among those determined to vote, like David Rodriguez of Rahway, there was confusion about election arrangements. Rodriguez walked the streets of Newark on Sunday afternoon; he came to shower at a friend’s place. The utility company had told him not to expect power (or hot water) for between eighteen and twenty-two days. When I asked what was going on with voting in Rahway, he said, “I have no idea. I think they might reschedule it.” But only Congress can alter the date of the presidential election, I responded, to which he fumed, “You’ve got to be kidding me.” Rodriguez noted that many folks on one of the few trains running from Rahway were similarly perplexed about how to vote (Rodriguez is an Obama supporter). Indeed, I later drove through Rahway. Downed power lines and street signs were still everywhere; dangerous intersections had no traffic lights, houses were crushed by large oak trees. Some polling sites have been physically destroyed. In Moonachie, which experienced unprecedented flooding, shattered glass covered the main entrance of borough hall on Saturday evening. Copy machines and desk chairs were toppled in the atrium. A resident walking past, Sal Lena, said the notion that voting could proceed on Tuesday was “ridiculous. They should put it off.” Lena’s family lost three cars, their first floor and basement, plus countless irreplaceable possessions. “I’m really not focused on the election,” he told me. 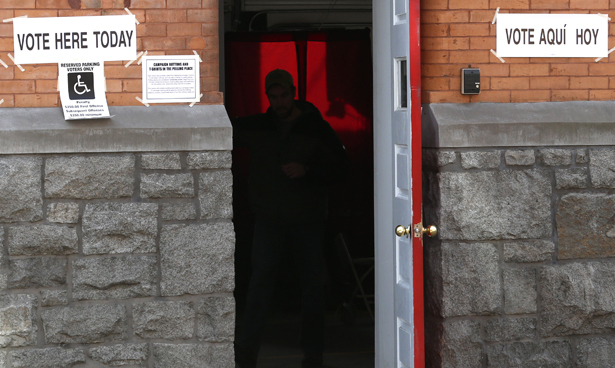 In Newark, where 70 percent of the North Ward was without power as of Saturday, the Essex County Clerk’s office had been ordered to remain open over the weekend to accommodate citizens who wished to vote early. Those who arrived by 4:30 pm could cast paper ballots. I am registered in Essex County, so decided to vote there on Sunday. The process took around two hours, and was marked by considerable disarray; workers did the best they could, but they seemed overwhelmed. One erroneously announced that prospective voters were required to produce ID. Christopher Durkin, the county clerk, later assured me that this had been corrected. Astonishingly, Durkin said he was hoping for 50 percent turnout in Essex County. In 2008, turnout was 69 percent. Numerous polling places lacked power, he told me, including three in neighboring South Orange—meaning some sites had to be consolidated and moved. Durkin said that “Reverse 911” calls would be put through to all county residents on Monday to inform them of any changes. But, of course, many areas remain without power, and therefore without consistent phone/internet service. Let’s assume that Durkin’s optimistic prediction was accurate, and turnout decreases by only 19 percent in Essex County. Among which demographics is this depressed turnout likely to be most pronounced? Answer: heavily urban areas—Democratic constituencies where people are poorer, less mobile and less likely to hear updated information from authorities. Durkin, the county clerk, seemed incredulous at the "vote-by-email" idea and told me he would order that such ballots be treated as provisional in Essex. Other places will be supplied with military trucks as replacement polling sites, which seems likely to intimidate some voters. This emergency is not limited to Newark, Rahway or Hoboken. Expect very low turnout in Atlantic City, Edison, Jersey City and other Democratic strongholds (although, Republican-leaning areas along the coast have also been devastated). If Romney now wins New Jersey—a possibility with which national media has not yet grappled—the state is certain to plunge into even further crisis.